New Orleans Plantation Country, Louisiana – The message behind the sign and roped barrier that meet us as we enter the Riverlands Christian Center in Reserve, Louisiana is clear. The capital letters declare their message without apology or subtlety: FOR WHITES ONLY. This isn’t a laundry sorting station. My family immediately knows what it means. “What was your first thought when you saw that sign?” our host Rita Perrilloux asks. It’s true. When the time comes to choose a seat, our whole family makes sure to cross that line. It’s a moment of symbolic rebellion for sure but it’s an easy one to do in 2018. Cameron breaking barriers in New Orleans Plantation Country. The sign is only a prop now, meant to stir the emotions and create dialogue amongst visitors to the center which is both a church and a museum. But, at the time this church first came into existence, it was a harsh reality. Rita’s husband Steven, the current pastor of Riverlands Christian Center, can still remember what it felt like to be segregated to the back rows of local churches; unable to participate or take communion alongside white parishioners. He can also remember what it was like for the Black community to finally have a church all their own. 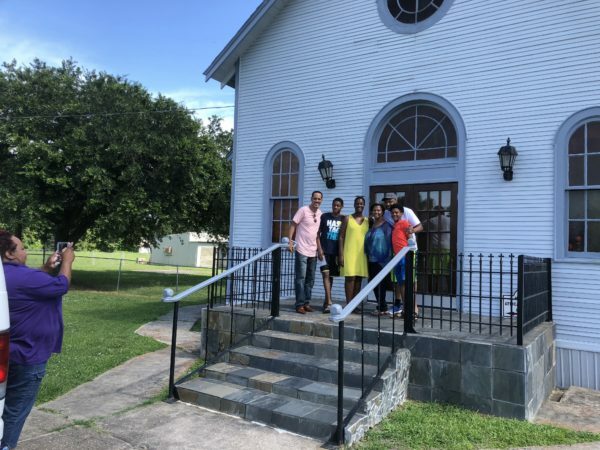 The building we’re standing in, used to be known as “Our Lady of Grace Catholic Church.” It started out as a school for black children in 1931 and added a church parish in 1937 – becoming the area’s first Catholic Black church. After years of being treated as less worthy while they worshipped, local Blacks could – for the first time – fully participate in services. In 1991, the Archdiocese designated this sanctuary a historically significant artifact and donated it to Riverlands Christian Center Church. The Perrillouxs immediately went to work. They had it registered as a National Historic building and then raised the funds to transport the building to its current location. But the Perrilouxs knew they wanted to do more than just lead services in the building. Over the years they’ve added poster boards to the walls that detail points of Louisiana musical pride and launched the Soul River Musical Journey tour that includes a slideshow and highlights the way Black music has played a role in world history. They’ve opened a lending library so that local children have access to Black authors and stories, and they speak to countless groups who visit New Orleans Plantation Country about what life was like and the many reasons that they should never forget the area’s history. 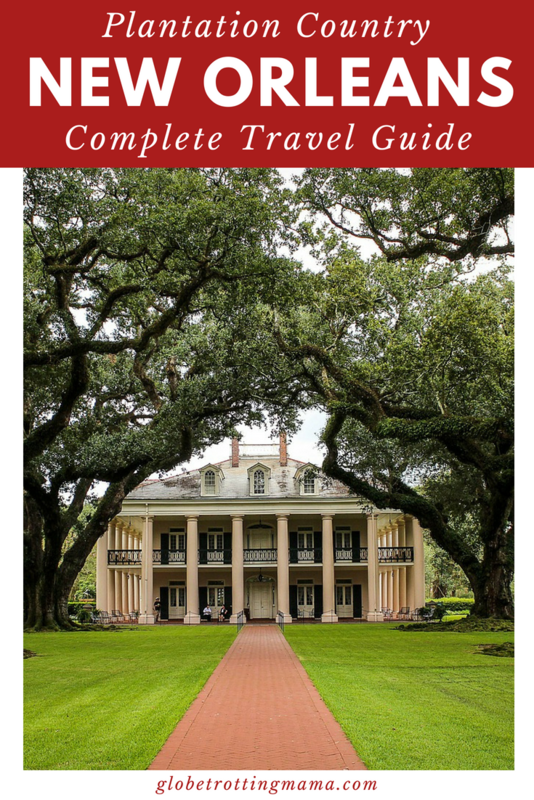 Those lessons are continued with a visit to Laura: A Creole Plantation in Vacherie. Once known as the Duparc plantation, the way history was told here has always been important to the owners. From the moment you stand outside the bright yellow and green house, your guide implores you to understand the importance of all of the stories that happened here. The detailed family history includes the reminder that sexual assaults often meant slaves were related by blood to the people who enslaved them. 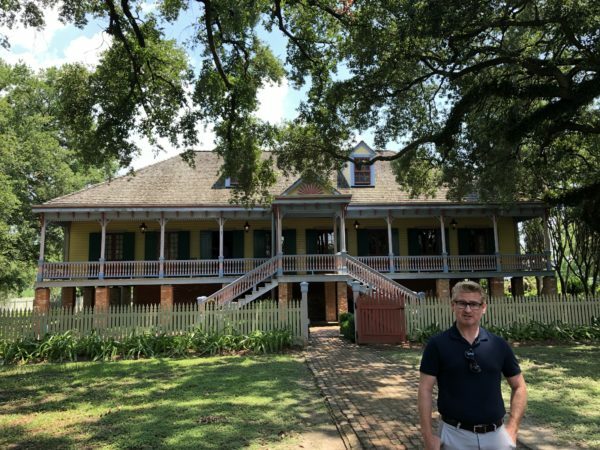 Joseph Dunn shares some of the history at Laura: A Creole Plantation in New Orleans Plantation Country. 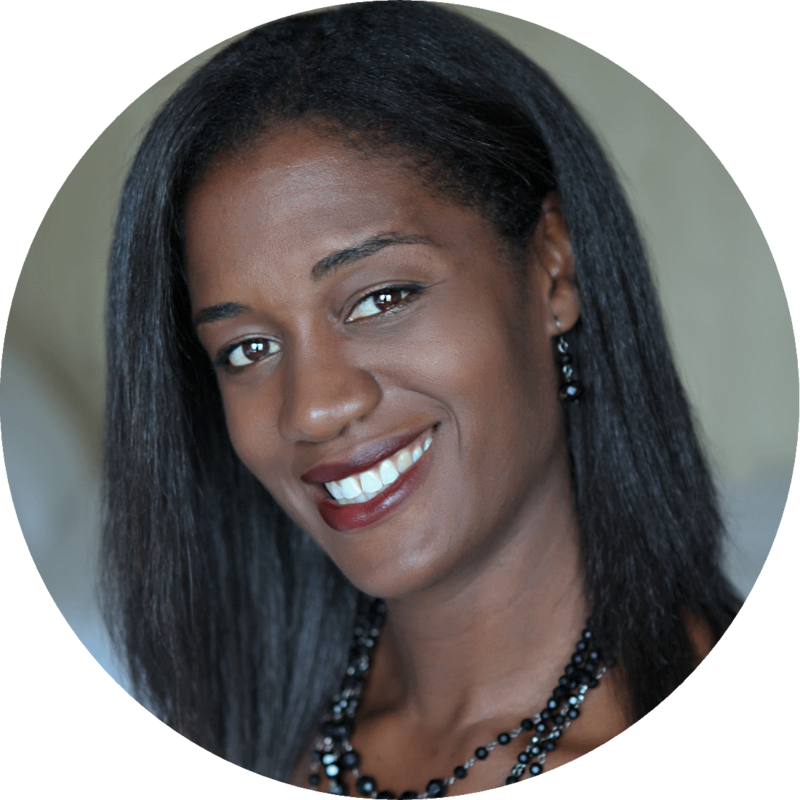 From the mentions of Senegalese slaves who built the impressive home to the lesser known stories of the women – including matriarch Elisabeth Duparc Locoul – who reigned over the plantation for many years, the tour strives to be inclusive and honest. There is no sugar-coating of the tragedies of the slavery story and it is told in all of its complexity while also offering a deep dive into the Creole experience and how it differs from the typical American slave story. There are several plantations throughout the area, but architecturally this one stands out with its bright yellow building and dark green shutters. Yet another perspective awaits at the Whitney Plantation. My family spends much of our time there reading the poster boards in the main building. We’ve visited this plantation before, but new exhibits make a return worthwhile. I’d grown up hearing stories of the trans-Atlantic slave passage but the information about the domestic slave trade within America offers a new perspective on the brutality of the time. At the same time, this plantation – which focuses on the slave perspective – offers points of pride and a better understanding of the lengths to wish slaves resisted and revolted against the system. Perhaps the most jarring aspect on property is the 1811 Slave Revolt memorial where replica heads sit on spikes in memory of the way in which the failed mutineers were displayed when caught. It’s a stark reminder that slavery wasn’t nearly as clean or polite as the television shows and movies – no matter how gruesome they seem – have portrayed it. The stories are sobering and the memorials a reminder that these were individual people who were treated so inhumanely. 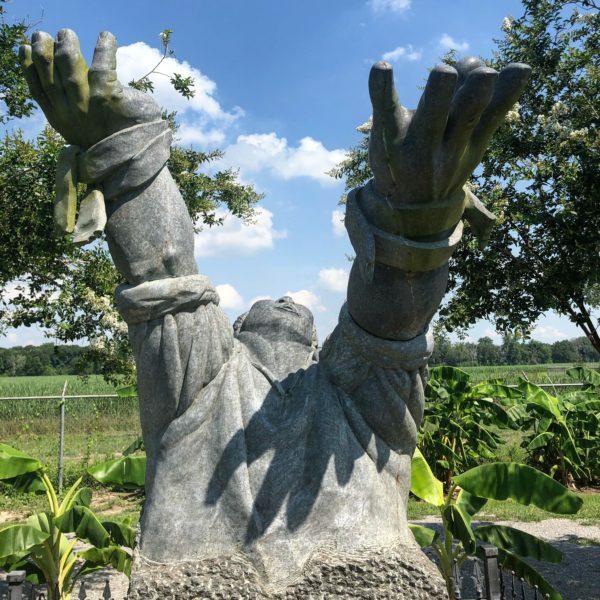 Stunning sculptures successfully evoke emotions in visitors to the Whitney Plantation. Not all of our experiences here are sad ones. Much like the rest of this area, the Whitney too has its beauty. Art installations across the grounds are artistic symbols of power and resilience: broken chains, arms stretched high. You leave the plantation less focused on what was done to people, and more focused on the people who survived what was done to them. It’s a reminder of the resilience and perseverance of a people. Back at the church we get a sample of what Southern hospitality is all about. An award-winning singer himself, Steven Perrilloux treats us to a song and the couple sits with us over lunch for a conversation that is candid and inspiring. 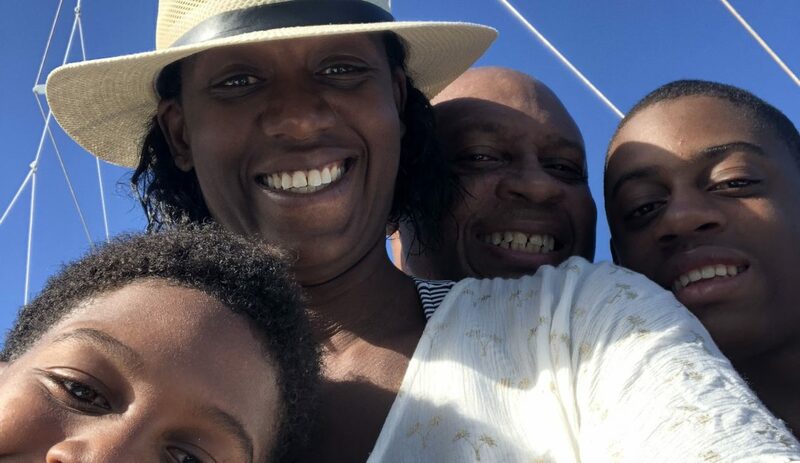 As we laugh over a meal of collard greens, fried chicken, macaroni and cheese and more, I’m reminded of how easily the competing emotions of grief and joy can lie together. The beauty of this place lies at the crossroads. It’s where the tears and the laughter meet. Our family poses with the Perrillouxs on the steps of the historic church. 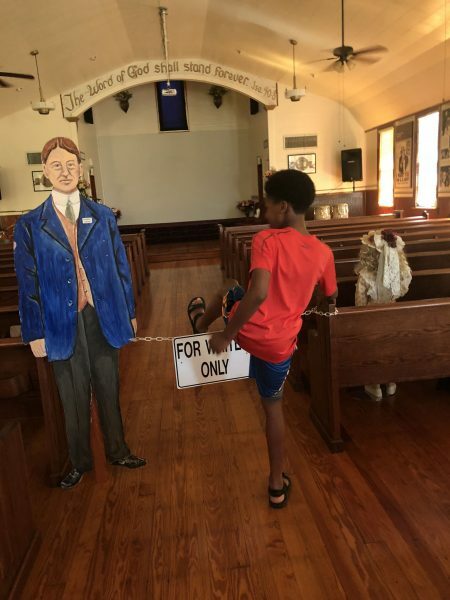 Disclosure: My visit to New Orleans Plantation Country was subsidized in part by VisitNOPC.com. All opinions, as always, are my own.